Influencer Marketing Hub has already created a very comprehensive list of 15 tools that you can use for free to discover influencers for your campaign. You may have tried using some of those tools and found that they work for you. But what works for one marketer doesn’t necessarily suit everyone. So we’ve decided to come up with another list of tools to identify influencers for free. Influence.co is one of the best free tools for discovering influencers in a relevant category. You just need to enter a category and conduct a search. This will give you a list of all influencers on the platform who create content relevant to the category. You can filter the results by location and follower count. You also get access to the advanced search feature, which lets you filter results by a wide variety of factors. You’ll be able to narrow down your search based on engagement rate, monthly website visits, age, gender, rate, and more. So using this feature, you will have an easier time finding highly relevant influencers who perfectly fit your budget. Klear provides a host of free influencer marketing tools that you can use to identify influencers. You have the option to find influencers on specific social media platforms, discover influential bloggers, and find influencers in a specific location. So you can conduct searches based on your unique needs. However, you can use only a few basic features of the tools in the free version. 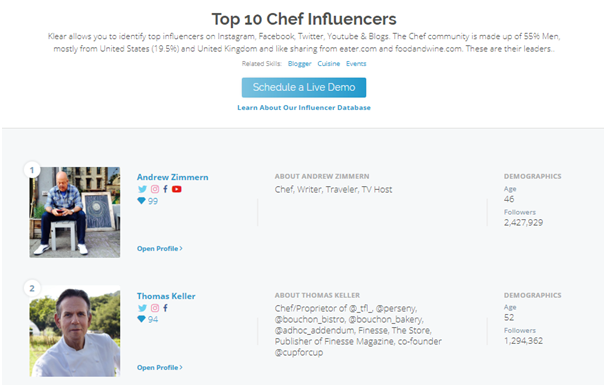 For instance, when you search for chef influencers on Twitter, it will give you a list of top 10 chef influencers. So there are some limitations, which may not make this tool suitable for every business. At the same time, you can view useful metrics such as audience demographics and follower count. Klear also gives each influencer an influencer score, based on these important influence metrics. In the following screenshot, for instance, the top chef influencer Andrew Zimmern has a Klear influencer score of 99. The Makrwatch platform is highly effective for identifying influential content creators on YouTube. You first conduct a search based on a certain topic, and then you have the option to filter the search results. You can opt to discover influencers who get a certain amount of views per video, engagement rate, subscribers, and videos per week. You can further ensure that the campaign reaches your target audience by filtering the results based on audience location, age range, and gender. The tool provides plenty of filters that let you narrow your search down significantly so you can easily discover the most ideal influencers for your campaign. In fact, you can even prevent certain channels from showing up in the search results. So even if there are certain influencers you don’t like or have already worked with, you can ensure that they don’t show up in the search results. Influry is an influencer marketing platform that lets you create a free account to get started and you only have to pay as you grow. The software helps you find ideal influencers within their database of 10 million worldwide influencers. You’ll be able to get relevant results based on your target audience and using different filters. InfluencerDB is one of the leading influencer discovery tools that you can access for free. You can conduct a search for influencers in a relevant category such as food, fashion, lifestyle, travel, etc. You can also enter other details such as follower count, like to follower ratio, country, language, etc. All of these factors can help in narrowing down on the most relevant influencers for your campaign. In addition to discovering influencers for free, the tool also gives you a detailed analysis of influencer accounts. You can get an overview of metrics such as follower growth rate, like to follower ratio, and media value per post. So you can further look for influencers who perform well and are within your budget. The Moz Followerwonk tool has been around for quite some time and is one of the pioneers in influencer marketing platforms. The free version of this tool lets you conduct 50 Twitter profile searches in a day and provides you with 100 results per search. You can analyze accounts that have up to 25,000 followers and do 20 comparisons in a day. 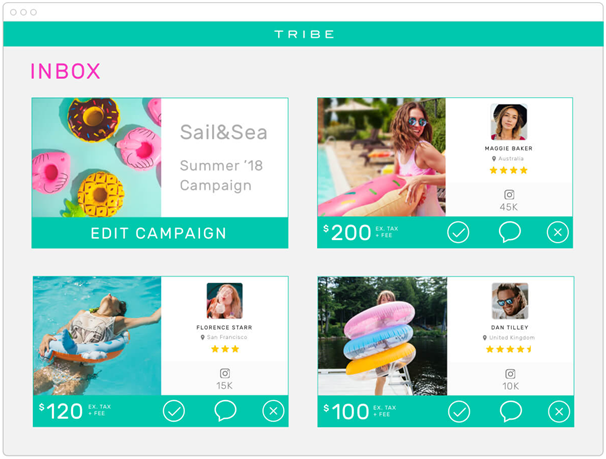 TRIBE is an influencer marketplace that lets you create campaigns for free and receive high-quality influencer content before you pay for anything. You can discover influencers through the content they create for your brand. So instead of focusing on any other aspect, the main focus is on creativity and content quality. You only pay for the content that you want to use. Tubular is another platform that focuses on finding YouTube influencers. You can create a free account, using which you can conduct a basic influencer search and gain access to basic influencer information. You can view the top 25 leaderboards for influencers and brands as well as industries. Shoutcart has a database of 400 million influencers across various industries. 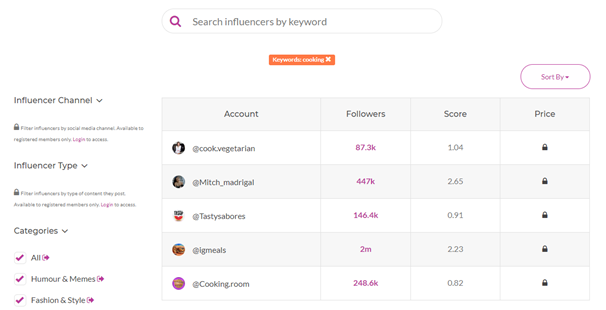 In the free version, you can begin your search using a keyword and view the top five influencer accounts in that category. 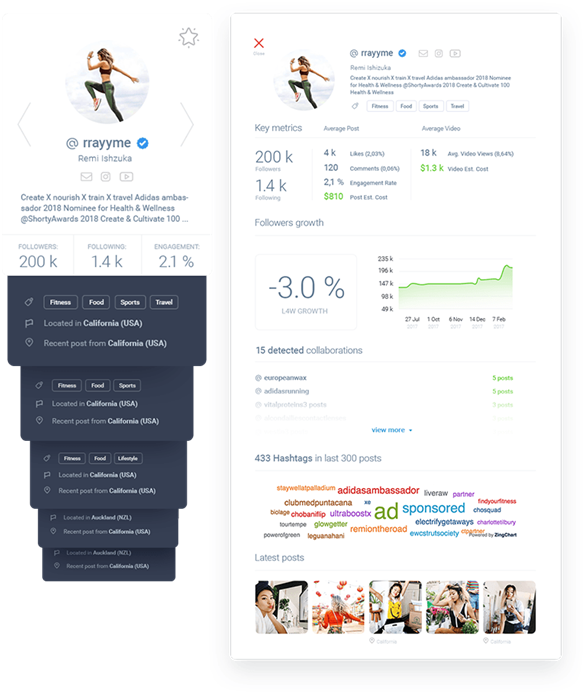 The tool also gives you influencer information such as follower count and score. This score is a Shoutcart system that ranks influencers based on their level of influence. You can use a free trial of the NinjaOutreach influencer marketing tool for 14 days. The tool lets you gain access to a database of more than 25 million influencers. Filter your results based on the niche relevant to your business and gain access to the contact information of influencers you’d like to work with. Tomoson provides a free influencer search platform that lets you conduct searches based on different categories. You can filter the results based on influencer type and even choose to view only micro-influencers in the category. The search results page shows you various details such as total reach, price range, and average engagement. 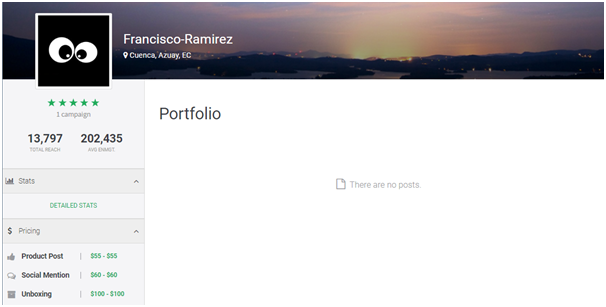 You can click on the profiles that interest you can view various details about each influencer. If the influencer has created any branded content before, you can view them in their portfolio. You can also view details such as their pricing information. You’ll be able to see how much the influencer charges for each post and for different kinds of content. FameBit is an influencer marketing platform where you can sign up for free. You will gain free access to a massive community of content creators in your industry. You set a budget and then create a campaign for which interested influencers submit content for the campaign. The payment is made only once you approve of the content that you’re using in the campaign. Shout is an underrated influencer discovery tool that lets you conduct searches using keyword and location. You just need to add relevant keywords to your account and the system will automatically show you the most relevant influencers. 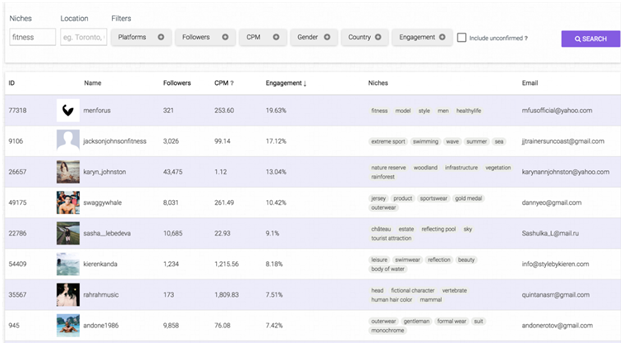 You’ll be able to view useful influencer data such as engagement, follower count, etc. And you only have to pay to gain access to influencer contact info. What’s great about Shout is that it lets you access the audience demographics of each influencer. You can see how well each influencer can reach your target audience. Additionally, the tool helps you compare the effectiveness of potential influencers and gives you an estimate of how much it will cost you to reach every 1,000 people. Scrunch offers a basic starter version of their influencer marketing platform for free. This version lets you create one campaign and provides you with 40 results per search. You can conduct a search for influencers by niche, location, industry, follower range, social network, and engagement rate. 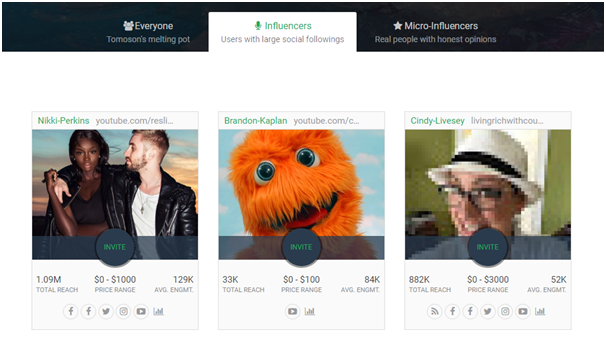 And you get access to detailed influencer profiles to understand the best influencers you should collaborate with. Heepsy is an influencer marketing platform with more than 3 million influencers in their database. You can find influencers in a specific location in order to reach your target audience. You can view details such as follower count and engagement rate to see how well the influencer can deliver on your campaign expectations. The free version lets you do a basic influencer search that looks through the entire platform database. And you will be able to view the influencer bio to determine how suitable they are for your campaign. The more advanced filtering options are available in the paid versions of the platform. You can also view details such as the popular hashtags the influencer has used to see how regularly they create content related to your niche. And you’ll even be able to see how many collaborations the influencer has done in the past. The Verb app lets you sign up for free and create your own product listing for influencers to discover. Influencers can apply to participate in the campaign and you can easily discover ones you’d like to work with. You can view influencer data such as average followers per post, average likes per post, and average comments per post. 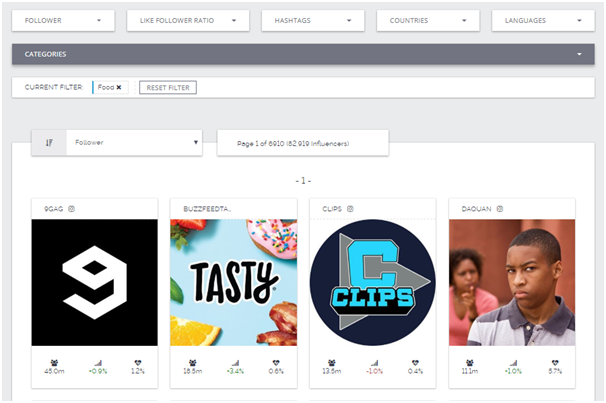 SocialBook is a tool for discovering influential accounts on YouTube and Instagram. 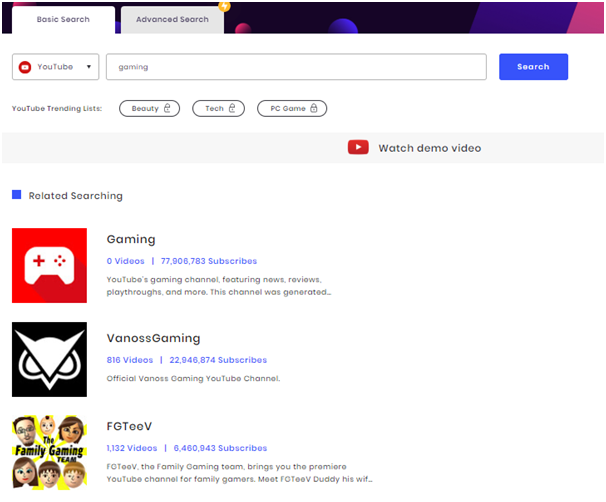 The platform is accessible on a freemium basis and you will gain access to the basic YouTube search feature for free. You will also be able to view basic influencer profiles and use basic filters to narrow down your search in the free version. As you can see in the screenshot below, you just need to enter a relevant keyword to conduct your search. And you will be able to view basic influencer details such as number of videos and number of subscribers. You can also get a brief description of the channel to understand what they do. Smaudience is another influencer marketing tool that uses a freemium model. You just need to register and you can access the influencer discovery tool for free. It mainly conducts a search on Instagram influencers who have high reach and engagement. It also focuses on influencers who are already engaging with brands relevant to your industry. This increases your chances of finding a relevant influencer. The platform allows you to review the influencer content to see how well they can tell your brand story. You can then select the influencers you’d like to work with and directly reach out to them for your campaign. These are 18 of the best tools that will let you find potential influencers for free. As you can see, some of them are available completely for free. Others are available for free trials, while some follow a fermium model. Go through each of these details thoroughly to see which one will work best for your business and campaign requirements.